If you’re down on tofu, this recipe will change your mind. 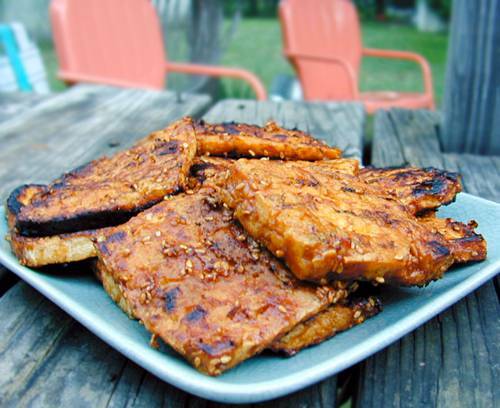 Pre-frying pressed tofu slices gives them extra flavor and a wonderful chewy texture you’ll love. The marinade was inspired by one used in Lorna Sass’s New Soy Cookbook. Please use fresh garlic (you’ll be rewarded by the flavor). If you have extra tofu, dice it, fry it in the leftover frying oil, then shake it in a brown paper back with salt and pepper or your favorite seasoning mix and a pinch of sugar. Serve this tofu on thick grilled pita bread with Malin’s Turkish Salad or Cold Rice Salad (or both) as a condiment.Leftover barbecued tofu is terrific scrambled with eggs or crumbled into beans for breakfast tacos or burritos. Use a separate part of the grill and separate tongs to cook vegetarian food. Your veg guests will appreciate it. Wrap the tofu in a clean dishcloth or several paper towels. Put a heavy pot on top while you prepare the marinade to press out the excess fluid. Combine mustard, ketchup, soy sauce, garlic, molasses, sesame oil and cayenne in a shallow dish. Set aside. Heat a clean, dry nonstick pan over medium fire for about 1 minute. 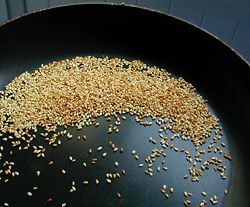 Toss in sesame seeds and toast, shaking pan occasionally, until they’re a nice golden brown. Cook for a moment and add to marinade. Slice pressed tofu into 1/4″ slices. Pat excess moisture off surface of slices. Add enough vegetable oil to cover the bottom of a frying pan. Heat oil for about a minute over medium flame. Carefully add slices of tofu to pan (if it’s not well-drained ,or even if it is, it may splatter a bit, so use caution) and fry until golden, about 3 – 5 minutes on each side. Drain on brown paper bags. Repeat until all slices are fried. Add fried tofu slices to marinade and turn to coat. Let marinate 30 minutes. 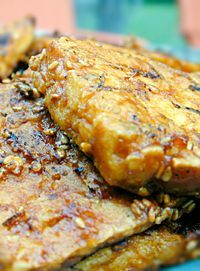 Tofu doesn’t really absorb marinade beyond the outside layer, so marinating longer won’t add more flavor. 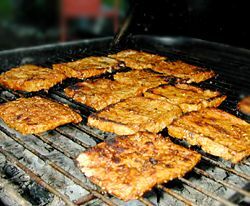 Grill tofu slices over hot coals for a minute or two on each side. Be careful, because they burn quickly. WARNING: Keep your eye on the tofu, as it goes from crispy to charcoal very quickly. I like it just a tiny bit charred, as shown above. Meanwhile, heat slices of thick pita bread on the grill as well. By the time the tofu is ready, the bread will be nice and hot. Serve tofu in the pita topped with Turkish Salad or Cold Rice Salad. This entry was posted on Thursday, September 6th, 2007 at 6:19 am	and is filed under Cookout, Main Dishes, Master Recipe Index, Vegan or Vegan-able, Vegetarian. You can follow any responses to this entry through the RSS 2.0 feed. You can leave a response, or trackback from your own site.